This is a good Cebu map. Most of the cities and towns are shown as well as the major highway that runs north and south. Cebu city metropolitan area is composed of 5 component cities and connected to Mactan Island and Lapu-Lapu City via 2 bridges. The airport is on Mactan Island and is officially called the Mactan Cebu International Airport. The major beach resorts are also on Mactan Island. Cebu Island is a long narrow island stretching 225 km (140 mi) from north to south, surrounded by 167 neighboring smaller islands, that includes Mactan, Bantayan, Malapascua, Olango and the Camotes Islands. It lies to the east of Negros Island; to the east of Cebu Island is Leyte and to the southeast is Bohol Island. 30,000 years ago the Negrito race crossed the Asian continent through land bridges. With the disappearance of the bridges, islands were formed, Cebu was formed. Being part of the Malay Peninsula, Cebu was part of the Malay empire around 500 A.D. Early inhabitants referred to this island as Zebu or Sugbu, whose trade and commerce reached as far as Thailand and China as well as the nearby Malay countries. As seen on the Cebu map, Cebu is known for its narrow coastlines, limestone plateaus, and coastal plains, all characteristics of a typical tropical island. Cebu also has predominant rolling hills and rugged mountain ranges traversing the northern and southern lengths of the island. Cebu's steep mountains reach over 1,000 meters. Flat tracts of land can be found in the city of Bogo and in the towns of San Remigio, Medellin, and Daanbantayan at the northern tip of the province. Its capital is Cebu City, the oldest city in the country, which forms part of the Cebu Metropolitan Area together with 6 neighboring cities Carcar City, Danao City, Lapu-Lapu City, Mandaue City, Naga City, Bogo, and Talisay City and 6 other municipalities found on the Cebu map. Cebu is served by Mactan-Cebu International Airport on Mactan Island, thirty minutes drive from downtown Cebu City. When Cebu was "discovered" by Spanish explorer Ferdinand Magellan in 1521, it was truly a discovery, for it opened the eyes of the world to what it did not expect to see. The island, with its natural port, was a logical destination, and its people, so steeped in the ways of trade and commerce, were its greatest natural resources. 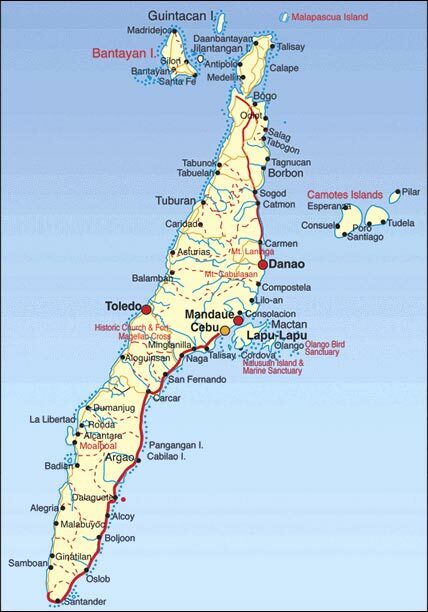 The island is infamously known as the site of Ferdinand Magellan's death during the Battle of Mactan shown as Mactan Island on the Cebu map. Fast-forward 436 years, and Cebu remains a discovery. It remains that one bright spot, situated right at the geographic center of the archipelago. It is the fastest growing economy in the country, with an average growth rate significantly higher than that of the entire nation, and any other province. The Province leads 78 other provinces in gross assets, equity and total income. There is a reason why this small island leads the entire country in exports of furniture, fashion accessories, carrageen, gifts, toys, and houseware. There is a reason why Cebu consistently gets the biggest chunk of tourist arrivals yearly, and has become the tourist gateway to Central and Southern Philippines. Perhaps, it is because the island is naturally situated to become the center of all this action. It is a natural port as you can see on the Cebu map. More than 80% of inter-island shipping capacity is based here, on this small island. It is the most accessible place to and from all points in the country, with more domestic air and sea linkages than even Manila. It is naturally safe. It does not lie within any earthquake zone or typhoon belt. There are no volcanoes on the island. The location is sheltered from incoming typhoons and is rarely subjected to the tropical storms that hit Luzon and Manila. It has the necessary, well-balanced infrastructure to remain competitive, and to sustain development. And yet, within minutes from its cosmopolitan quarters as shown on the Cebu map, you are immediately transported to resort settings and natural wonders. Moreover, an independent, self-reliant, entrepreneurial culture pervades the island, which makes its people eminently positioned to seize the opportunities that nature presented it. Cebu has had four centuries of being discovered by the world. Discover today this island and its people.